Isa Gusau, Maiduguri: The National Universities Commission, NUC, has granted recognition ‎to the Borno State University with approval for the commencement of academic activities, Executive Secretary, Professor Adamu Abubakar Rasheed announced before Governor Kashim Shettima on Monday in Abuja. With the approval, the Borno State University, a legacy of Governor Shettima’s administration, is free to begin recruitment of staff and admission of students which the Borno Government is planning for January 2017. Governor Shettima was the NUC on Monday alongside a “powerful delegation” comprising Senators, members of House of Representatives, almost 50 professors who hail from Borno State, state lawmakers, elders and other stakeholders with a request for formal recognition of the State University by the NUC. The NUC had sent different technical teams for assessment of physical infrastructure at the site of the Borno State University in Maiduguri. One of the teams led by the Director in charge of academic standards at the NUC was in Maiduguri last week for another inspection of infrastructure. At the NUC’s auditorium where the Borno delegation was received, Governor Shettima told the Executive Secretary that the State Government has recorded tremendous progress in the physical development of the University as confirmed by assessment teams that visited the University. “In our first phase of physical development, we awarded contracts of N3.4 billion for construction 5 faculties of Science, Social Science, Management Science, Arts and Education while we are putting in students hostels and other facilities. At full maturity, the University is expected to have 12 faculties, 77 Departments, 281 undergraduates and school of postgraduate studies as well as basic and Remedial studies. We have made giant progress and to quote some members of the NUC’s technical team that saw things for themselves, “many State Universities took off with far less than what we have seen. The Borno State University has more than what it requires for taking off by January 2017″, end of quote. I am confident that the Executive Secretary shares this passion and we respectfully look forward to a kind and accelerated recognition” Shettima said. The Governor also explained that ‎Education has suffered a setback in Borno State as result ‎of severe attacks by Boko Haram. “At the risk of sounding repetitive, Borno State has been taken 50 years backward, no thanks to the vicious Boko Haram we inherited in 2011. As we all know, hate for education is the fundamental principle of the Boko Haram. This explains why they focused so many attacks on educational institutions. Executive Secretary, Sir, in the educational sector alone, a total of 5, 335 classrooms and other academic buildings were destroyed by insurgents across 512 primary schools, 38 secondary schools and two tertiary institutions in Borno State. The objective was clearly to bring down education in a State that has a long history of learning. As far back as 625 years ago, Sultan Uthman Bin Idris of Borno in his communication with Sultan Barquq of Egypt in 1391, portrayed Borno empire as one that takes pride in writing and learning. Today, Boko Haram wants to reverse that noble pride but we will not let them do it, Insha Allah. We shall continue to invest heavily in education. Borno State has 7 tertiary institutions and despite the Boko Haram insurgency and its huge financial impacts, we are in the category of States that pay the best salaries to tertiary workers and most importantly, we do not owe salaries. I know it will be a major responsibility to add a University to our too many expenditures that include ongoing reconstruction of destroyed communities, but then, if we are serious about ending Boko Haram, if we are serious about rebuilding Borno and repositioning it for the future, there is nothing like providing quality and affordable education to our teeming population of uneducated youths. Education is the greatest leveler, it is the key to solving the variety of social problems” the Governor noted. 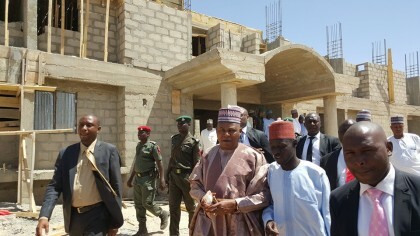 The Executive Secretary of the NUC, Professor Rasheed said because the NUC was already ‎of the progress made at the Borno State University site as well as the review of the master plan and academic brief as well as existence of a law establishing the University, there was no need to delay approval by the NUC. “It is my honor and privilege to hereby present to His Excellency, Governor Kashim Shettima a letter of recognition by the National Universities Commission for the take off of Borno State University located in Maiduguri. This recognition will be communicated to JAMB, NYSC, TETFUND and all relevant stakeholders” Professor Rasheed said.